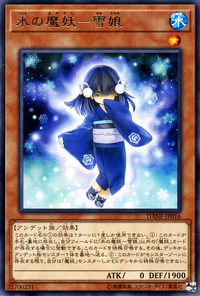 If this card is in your hand or GY, and you control a “Mayakashi” card, except “Yuki-Musume, the Ice Mayakashi”: You can Special Summon this card, and if you do, send 1 Zombie monster from your Deck to the GY. You can only use this effect of “Yuki-Musume, the Ice Mayakashi” once per turn. You cannot Special Summon monsters from the Extra Deck, except “Mayakashi” monsters. This monster is a downgraded form of “Yuki-Onna, the Ice Mayakashi”. Her name translates to snow girl, as opposed to the other, older snow woman.